I feel absolutely gluttonous over here. I'm not used to such luxury! In considering all the possibilities, there is really only one project that deserves to be knit with these skeins. Wound and ready for ... yep you guessed it, more garter stitch. Will it ever stop? I am happy to report that I am officially on vacation (thank the heavens!) and will be spending the next 10 days in Portland, Oregon, one of my very favorite places in the world. There will be Oregon Coast knitting and camping and a whole host of much needed relaxation. Don't you worry though, I've stored up plenty of blog fodder to power through. There is a wireless connection waiting for me there. (My dependency on the Internet is nothing short of shameful, but I'll own up to it). Hey. What did you expect in the face of all this beautiful handspun? 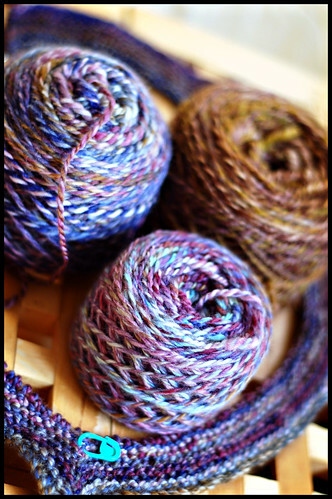 That is some beautiful yarn, and it looks like you are on your way to making some of your own! I highly recommend staying somewhere near Cannon Beach, OR (I live 80 m south of Portland) - Arch Cape is lovely. And Cannon Beach, while touristy, has some very good food and sometimes decent art. And! And! And! A VERY nice yarn shop (on 2nd, right in the main area). Go have some crab at Ecola and then buy some yarn - that is my ideal vacation. Enjoy! Adrian is truly gifted, her sense of color is delicious! you got some lovely skeins. Much better than the neon green I started you on! Mwahahaha! 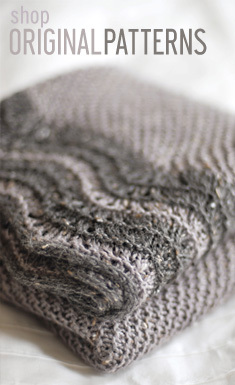 Beautiful handspun yarn... and stunning photos! Oh! Well welcome to the dark side. Once you get started with one of those little gadgets there's no turning back! I'm guessing that the handspun garterstitch is going to be a BSJ? A great use for beautiful yarn! And hey, have fun on vacation. Are you going to see Sundara??? That is some lovely yarn -- no wonder you got bit by the spinning bug! OK, Jared, now you really have to come visit us at Mabel's. 3041 SE Division, next to Detour Cafe (awesome sandwiches). Drop me an email if you think you'll pop by. I'll make you a cappuccino. Yum, lovely yarn! Hope you have a great vacation. I'm the same, I have to have Internet wherever we go. Yay! I hope you have a great vacation! This weekend is the Black Sheep Gathering in Eugene. Not far from either Portland or the Coast. You would find some lovely fiber for the spindle! I hope you have a relaxing vacation. The weather has been nice over here and it looks like it is to continue. The pluot is especially nice. I've avoided getting myself lured into hadspinning, but I'm eyeing a dying class at The Weaving Works. Enjoy the coast. Based on the current foecasts here in Seattle, it looks like you'll have a nice mix of good weather and just enough rain to make the coast moody and inspirational. oh lovely yarn for a lovely pattern. i mean both what comes out of knitting it but also the text in which elizabeth shows a great sense of humour and which started me on this bug. made one in noro silk garden and the rustic look makes any baby look like somebody coming back from woodstock. i called it the jimi jacket as i thought it looked like something suitable for the baby jimi hendrix never had to my knowledge. and everytime i read your blog i get my credit card ready for ordering new yarn... argh... but i do pull myself together. enjoy your holiday in portland. sounds like a blast. happy knitting. ::droooool:: Lovely eye candy and photography as always! Have a great vacation! Hey! Congrats on the new spindle, but be careful...it's just as addictive, if not more so, than knitting. Have a great vacation too! woo hoo , a convert! 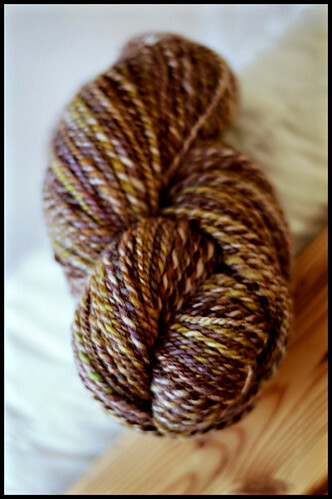 Congrats on your latest 'hardware' acquisition - she's a beauty, as is all that divine handspun. 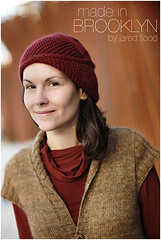 Just wait til you knit it up - there is absolutely nothing as fabulous as handspun. Have a great time in my neck of the woods. Where on the coast are you headed? I've signed up for a spinning class this summer. Your skeins are so beautiful - I can't wait to see what they become. Have a great vaca! oh my oh my, a spindle! enjoy your vacation! I'm in awe of your incredible handspun yummyness!! Have a blast while you're here! :) I live about 30 mins east of Portland...where on the coast are youheaded? it's been moody and beautiful all weekend over at Seaside, you never know what you'll get on the Oregon coast!! Well, if you're going to be in Oregon, you should take a trip to Eugene this weekend for Black Sheep Gathering, especially now that you've uh... succumbed.... to the dark side of spinning. It's the largest fiber festival on the west coast and there are beautiful things to be had everywhere. 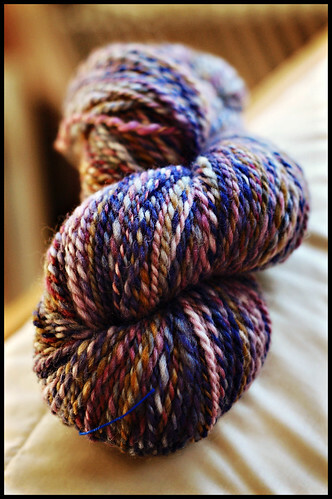 The handspun is gorgeous, and you started using a drop spindle when exactly? Good work! Have a great time here in Portland! I see some people sent yarn shop suggestions... In addition to Mabel's, I would suggest the Yarn Garden and Molehill Farm. And if you like chocolate, go to Lake Oswego, and knit in Moonstruck Cafe while sipping an amazing hot chocolate. Unfortunately, I'll be holed up working in the hospital -- or I'd join you. I am heading to Portland and the coast in a few weeks!! If you come across anything that is must see, be sure to blog about it!! I third the suggestion of taking a detour to Eugene for the Black Sheep Gathering (6/22-6/24). So many wonderful fibers available (pygora, cashmere, silk, all sorts of wools, alpaca, llama, mohair). Now that you are initiated to spinning, I see some self-designed yarns in your future. In addition, you get to see and pet all the lovely animals that provide the fibers! gorgeous handspun. i am SO jealous! There really is something special about handspun, especially when combined with the comfort of garter stitch. 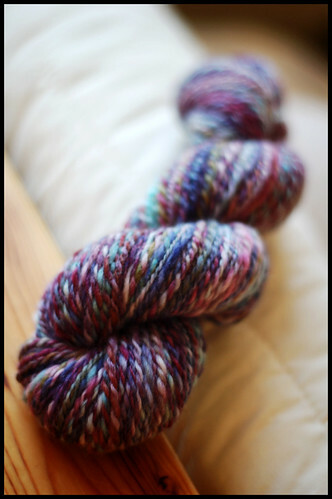 I don't think I'll be able to hold out on spinning too much longer, especially after just finishing a handspun Zeebee. It's so squishy I want to wear it, even if it is 90 degrees outside! Welcome to the club, I've got one of these too. :) It's somewhat inevitable, isn't it. 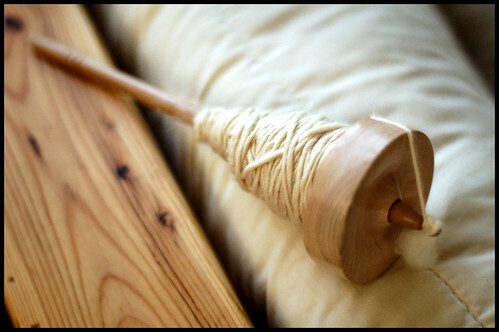 (and I got a spinning wheel as well, but I will stick to the top-whorl spindle first for getting more practice.